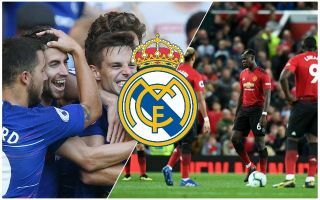 Real Madrid are reportedly looking at a number of big-name transfer targets for the near future, with raids on Manchester United and Chelsea possibly on the cards. Paul Pogba and Eden Hazard are both mentioned as candidates to come in at the Bernabeu, though other names may also be ahead of them in their thinking at the moment, according to Diario Gol. The report also links Real with interest in Juventus forward Paulo Dybala and Paris Saint-Germain midfielder Adrien Rabiot, but Pogba and Hazard could make fine alternatives. Both are among the biggest names in world football and would fit right in in the Spanish capital alongside the numerous other Galacticos on Madrid’s books. Diario Gol suggests Hazard would cost around €200million, while a previous Don Balon report also linking Pogba with a move away states he’d likely cost around €90m. That’s a lot of money, though not so much for Los Blancos if their spending record under Florentino Perez is anything to go by. The club should also have a decent amount in the bank after selling Cristiano Ronaldo to Juventus in the summer, and two big-name additions like this are just what’s needed to fill that void. Hazard would be an ideal like-for-like replacement for Ronaldo in attack, while Pogba would give the Belgian ammunition with his creative play in midfield, coming in as a fine long-term replacement for the ageing Luka Modric.